David Bailey, Kate Moss, 2013. Bailey’s latest exhibition, which opened in February at the NPG, has reopened an age-old debate about how what counts as art. Two eyes fix their gaze on a camera or perhaps, more appropriately, on a photographer. Their focus is steady but their expression is glazed, challenging anybody to define their intention. They are framed by a mane of professionally tousled hair and accompanied by the sharp shadows of chiselled cheekbones. A half-open mouth reveals a glimpse of statement teeth. Everything about the headline portrait for Bailey’s Stardust, which opened last month at the National Portrait Gallery, screams fashion icon. And of course that is exactly what Kate Moss, the subject of this attention-grabbing portrait, is. But is fashion photographer exactly what David Bailey is? This exhibition, which displays over 300 of Bailey’s portraits across the gallery’s entire ground floor, has reopened an age-old debate: what counts as art? 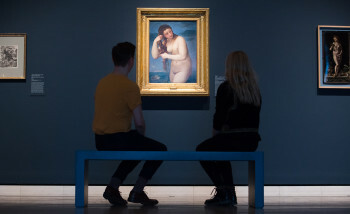 Critics are divided over the merit’s of the NPG’s blockbuster spring exhibition. But why? As Kate Moss stares at the camera she seems palpably aware of her celebrity. Eliciting total engagement with their stardom from his sitters is one of Bailey’s hallmarks. So what is it about these shamelessly glamourised portraits, so evocative of the Swinging Sixties - the period that made Bailey, that has stayed so powerful for so long? Over the years David Bailey has photographed industry heavyweights across fashion, film, music, design, art and photography. An icon himself, he was, along with Terence Donovan and Brian Duffy, one of the very first celebrity photographers. His story, as a lad from the East End who rose to rapid and meteoric success at Vogue, is well charted. With his working class background and charming, irreverent manner it would be easy to assume a double-edged interest in celebrity on his part. But looking at these works you’d be hard pressed to find irony. These portraits don’t ‘reveal’ or ‘uncover’ the star, they glory in their glamour. So what does this glorification, or ‘artification’, of glamour amount to? Jonathan Jones has written a searing review for The Guardian advocating that if “artistic brilliance were merely the creation of snazzy, glamorous, eye-catching pictures, Bailey would indeed be one of the greats” but that he is “inexhaustibly shallow” and “his brainless glamorama provides glib entertainment for people who can’t be bothered with real art.” Yet Alastair Sooke, reporting for The Daily Telegraph, revels in Bailey’s chronicling of “that most elusive, impalpable, yet desirable human attribute: glamour.” While it isn’t unusual to have two national newspapers disagree about the merits of an exhibition, this debate gets to the core of our engagement with media art. David Bailey, Damon Albarn, 2007. Similar portraits to the one of Moss appear of Damon Albarn (head filling the page, expression affectedly nonplussed, as if he doesn’t know why there’s a camera in his face) and Jack Nicholson (grinning maniacally outwards in clear reference to his famous onscreen personae). Indeed Bailey’s most famous early works are all in this style. His ‘Box of Pin Ups’ series were limited edition sets of six prints sold to be as exactly that - pin ups. They laid the groundwork for his black-and-white, crisply contrasted style. They are now displayed in the NPG in their original sets. In one example Michael Caine is shown with P. J. Proby, Celia Hammond and Gordon Walker, Terence Donovan, Brian Morris and Cecil Beaton and Rudolf Nureyev. Beaton, who himself photographed Nureyev, peers seriously over Nureyev’s shoulder as the intense dancer glances upwards, hand on heart, with a facetious look of self-satsified centrality. David Bailey, Francis Bacon, 1983. Some of the most interesting pictures in the exhibition focus on Bailey’s portraits of other visual artists. Cartier-Bresson retreats behind his own camera, a headshot of Man Ray in profile stands man-high and Damien Hirst swings naked astride a carcass. Francis Bacon stares at the camera, eyes locked, mouth open, just like Moss and Albarn. This gargantuan exhibition has been curated by Bailey himself. It is arranged entirely thematically, with no regard to chronology, and the NPG is keen to stress that visitors should explore the exhibition in any order they wish. Bailey too hopes the exhibition won’t be seen as a retrospective. 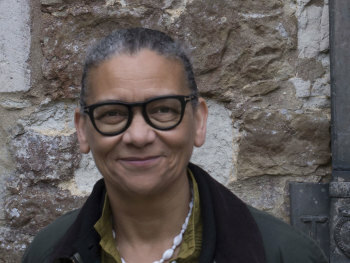 The exhibition is the realisation of several requests by NPG Director Sandy Nairne that Bailey mount a sizeable exhibition in a public gallery. David Bailey, Catherine Bailey, 1989. The exhibition isn’t just celebrity portraits. There is an entire room devoted to Bailey’s fourth wife Catherine. She is depicted in numerous guises – young and old, with children and without, dressed-up and as herself. There are even photograps of her giving birth. There are gut-wrenching representations of Ethiopian famine victims and other sections devoted to Bailey’s travels. Poignant depictions of the East End also pack a punch. There is a lot to see and it is wonderful to see the NPG devoting so much space to contemporary work. David Bailey, From the series Nagaland, 2012. When you visit think about your own expectations - what do we require from galleries, from the media, from fashion? This isn’t Kate Moss saying “I’m a real person, honest”, this is Kate Moss saying “I’m a star”. And maybe that’s what we flounder to call art. There’s no reveal, no vulnerability, no irony – just unadulterated glamour. Bailey’s Stardust is at the National Portrait Gallery until 6 June 2014. Rosanna Hawkins is a London-based arts writer and contributor to RA Magazine.